Teachers from the schools that won the first MatemaTikka awards for the best innovative projects in mathematics teaching and learning. The benefits of using diagnostic questions to gauge students’ understanding and learning process was the main theme of a presentation given by Craig Barton to over 150 primary and secondary school educators. Barton was the keynote speaker of the fourth edition of Tikka Matematika training seminar organised recently by the Education Ministry’s Directorate for Learning and Assessment Programmes. During the event the teachers took part in various workshops related to the theme, and the first MatemaTikka awards for the best innovative projects in mathematics teaching and learning were also announced. 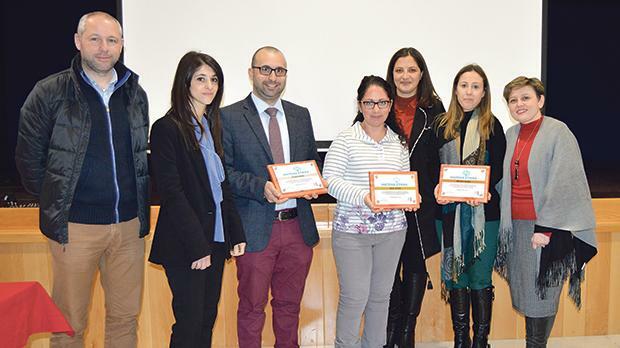 St Margaret College’s secondary school, Verdala, Cottonera won the gold award while silver and bronze went to Maria Regina College’s primary school in St Paul’s Bay and Maria Regina College’s primary school ‘A’ in Mosta, respectively. The training was partially funded by the Institute for Education and the European Schoolnet-coordinated Scientix 3 project, funded by the European H2020 research and innovation programme.